Two weeks ago, I blogged about the #getmoving with the OncoLink team challenge. I’m thrilled to report that the OncoLink team IS MOVING. It’s become quite a friendly competition. Having accountability partners works. We are motivating each other to get and keep moving throughout the day. Our team of four participating in the challenge walked 158,419 steps last week. That means we walked about 66 miles! Our challenge runs from Monday-Friday—but I’ve been doing more on the weekends too. Maybe next weekend we do the “weekend warrior” challenge too? Our families are moving more too—our kids, our spouses, our dogs. Our healthy habits are rubbing off on those closest to us. The more you do it, the easier it becomes. When I started the challenge two weeks ago my daily step goal was 6000. I’m easily surpassing that…averaging closer to 8500 steps a day, with many days over that coveted 10,000 step mark. We are becoming so much more aware of our behaviors. When you sit at a desk all day, it’s easy to get “dialed in” and not pay attention to the needs of the body to move. Now, when my Fitbit tells me every hour to move, I do. Whether it’s to let the dogs out, rotate the laundry, make lunch, or just stretch—getting up from the desk every hour is essential. I’m also standing more. For example, I usually sit on my couch to fold laundry. This weekend I stood up. Little changes make a big impact. The FitBit (or another tracker) is working for us. It sends us friendly reminders of our challenge, who is in the lead, how many steps you need to take the lead and even allows for us to cheer each other on virtually. We are doing this challenge in the middle of winter in the North East. It’s been cold—so I’ve found some great walking workout videos on YouTube for those mornings I don’t want to bundle up and head out for a walk. Other days, instead of just standing around chit chatting with other dog owners at the dog park, I’m doing laps AROUND the dog park. It’s a pretty large space and those steps add up. The key has been to think outside the [treadmill] box and to keep moving throughout the day. The question looming for us is, can we keep this up? We started our third week of the challenge this morning. As of 12:15pm, I have already logged 6,000 steps…and I’m in second place! Only 1600 steps separate the leader from 4thplace. So, I’d say this new habit is taking a firm hold on the #oncolinkteam. Have we motivated you? Christina is a clinical oncology social worker who joined the OncoLink team in 2014. Christina blogs about resources available to the cancer community, as well as general information about coping with cancer practically, emotionally, and spiritually. 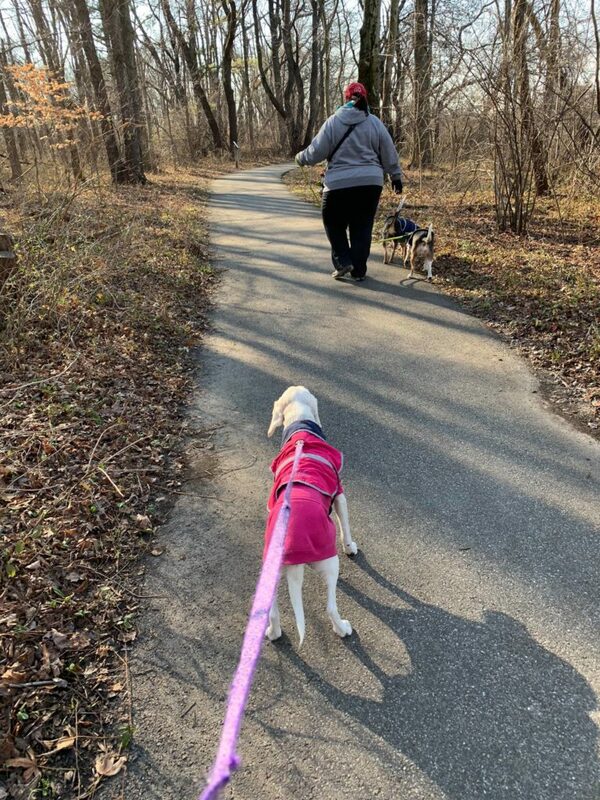 Christina is an avid knitter and spends a great deal of time sharing pictures and stories about her three beagles, Linus, Maggie and Huckleberry. She also loves to travel, cook and is an avid Philly sports fan. This entry was posted in Christina's Resource Round-up!, Homepage, OncoLink News and tagged cancer risk, exercise, get moving. Bookmark the permalink.